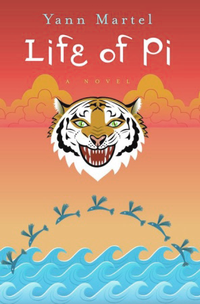 Mook Review: Life of Pi | mookology. January 16, 2013 January 16, 2013 / Mookology. My first experience with praised author Yann Martel was not through reading Life of Pi but his third novel Beatrice and Virgil, a lesser known but still wildly interesting story about a novelist named Henry and a strange taxidermist fan of his. While I wont go much into this story, I need to touch upon the captivating writing style Martel has mastered; the way he writes forces you to feel that the narrator is speaking directly to you in a way that I have not quite experienced in other reads. This same connection is established throughout Life of Pi and is, in my opinion, the reason why Martel’s stories are ones you carry with you even after reading is done. Life of Pi is a spiritual book and sets out to tell a miraculous story. Pi Patel is an interesting person; as a young boy he is captivated by religion and engrosses himself deeply in not just the Hindu religion, but Christianity and Islam as well. Pi’s family owns a zoo in Pondicherry, India, but shortly through the book his parents decide to leave Pondicherry to open a zoo in Canada. They set out on a ship with some of the animals and head west – however, the family is shortly thrown off course when a storm rolls through the ocean, destroying the ship, and leaving Pi stranded on a life boat with a zebra, hyena, orangutang, and a Bengal tiger named Richard Parker. Pi is such an interesting, and uplifting, character. He is incredibly human and therefore we can relate to everything he experiences. When he is first stranded he seems hopeful, then shortly becomes incredibly depressed. It is only when himself and Richard Parker establish a relationship that Pi realizes he is not alone and, without Richard Parker, he would have died. The twist at the end of the novel was definitely unexpected, but it forces you to love Pi for his incredible imagination and need to create a much better story than what had really happened. I thoroughly enjoyed this novel, however I did find it a struggle to get through and wouldn’t necessarily recommend it to everyone. Life of Pi is long and there is hardly any dialogue, so some readers may find that to be missing. The first thing I must say about this film before I go into the content is the wildly stunning use of CGI. The visual effects were stunning and unbelievably realistic. When “Life Of Pi” was nominated in the special effects category at the Oscars I was thrilled and I would hope this movie will take a win. Richard Parker, as well as all of the other animals and settings, looked lifelike and I didn’t for a second believe it was not a real tiger. Visually, this film was breathtaking. In terms of mooks, this movie really did not go wrong. Yann Martel’s novel left room for a great adaptation, however it could have been miscommunicated since so much of the novel’s content comes from Pi’s thoughts. I felt that Suraj Sharma, the actor who played Pi, did an incredible job of acting considering the lack of dialogue and interaction with a completely animated acting partner. There isn’t much that I disliked about this film at all. I thought it was fantastic and uplifting, just like the book. 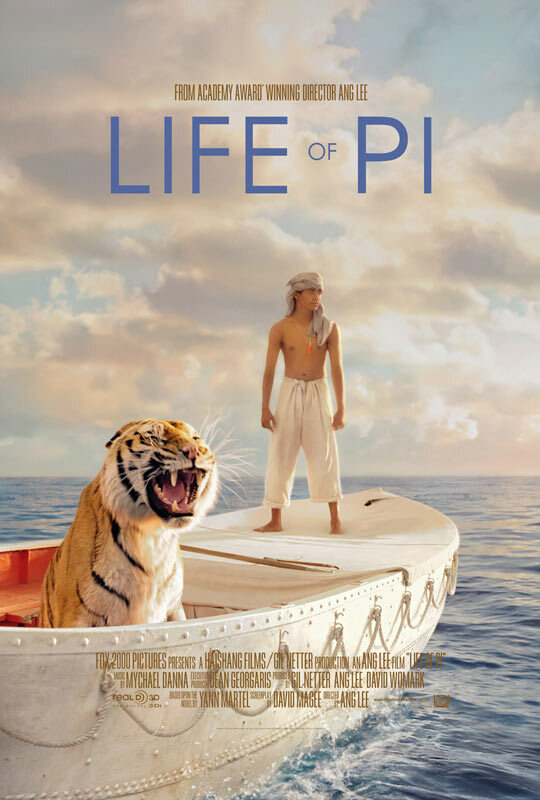 I strongly recommend this movie to anyone who is looking for a film about a adventure and I hope that we will see “Life of Pi” as a winner this awards season. Great summaries. Makes me want to go see the film. I can’t believe I haven’t already! I can’t believe it took me this long – it’s a must see! Brilliant descriptions. A thoroughly enjoyable blog. Thank you! Much appreciated, please keep reading. I’ve read the book but would love to watch the movie too! Is it better in 3D? We dont have a cinema in my town though so will have to wait for DVD release…. Is your 5 star review for the book, movie or mook? What if the one is great but the other lousy. How do you rate those? I’ve written a review for the book myself. Hey there – I didn’t see it in 3D but I would imagine it is incredible. My rating system is in regards to the mook. When I do my reviews, I take into consideration the elements of the book that I love and how it translated into a film, so when I give it a score it is based on how successful I believe the adaptation was. Thanks for the questions and I hope you get to see “Life of Pi” soon! I’ve heard mixed reviews about the book, but I think I might take a crack at reading it after seeing this post. Great job with the reviews! The book isn’t for everyone, a bit drawn out but still very uplifting. Thanks for reading! I have come across a mixed response for the book. As far as movie is concerned, I am yet to watch it. Well, its high time that I should give it a try and see whether my opinion matches your’s or not. Till then, Happy Reading! I always had a passion for this, but never had any spare time to do what you do. Keep up the good work i must say you have a pretty awesome blog here. thanks for enlightening me. Great idea for a blog. I want to read this book for sure now. Hi! Great review. I am a fan of your approach and format. With this particular review though, I would pose a question with regards to your claim that, “The twist at the end of the novel was definitely unexpected, but it forces you to love Pi for his incredible imagination and need to create a much better story than what had really happened” Is it your position that Pi made the animals up as part of an elaborate story to deal with the harsh realization of the truth? I trust you can understand that many people would see this as a bold assumption. Martel intentionally never closed the door on either story as being the correct plot for obvious reasons, and being a spirtual book (your words) is it out of the relm of possibility that Pi actually experienced life on the ocean with a tiger? Also, it is imporant to remember that the book & movie are based on premise that the story will make listeners/watchers believe in God. Its mandate is to make the readers/watchers believe in the unbelievable. So maybe there was a tiger on the ocean… Anyway, just a thought… Thanks for the review! I read Life of Pi in high school and liked the book. Like you said, the middle is hard to get through, but I thought the end made it work it. I felt like it was a book you like at the end. You like it for what it is overall. I was also impressed with the movie. It’s been a while since I read the book, but it seemed like they stuck to the plot pretty well, and they portrayed Pi’s thoughts well, too. Not to mention it was visually beautiful. It was really a pleasure to watch. Thanks for your review!